I had the ridiculously good fortune the weekend before this last one to meet up with some blogging friends -- Robin, Selena, and, the reason for it all ... Ana, who was visiting Seattle for the first time. Yay! We met at Elliott Bay Book Company where we bought too many books together and then had a lovely little sit down with lemonades. It was so nice to be with these dear friends in person. There were so many of you that we also wished were there too! Anyway, at one point we each volunteered what we were currently reading and I tried to explain my current read and completely failed, mumbling something about "dinosaur-ish author explores a city dedicated to books". My explanation might not even have been that clear! 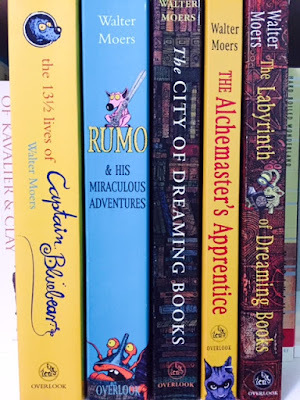 Then I just looked back over my blog and saw that I rave about most of the books in this series but can never quite explain what they are about in a way that doesn't make them seem ridiculously odd. So, here is my latest attempt to get some of you interested in the Zamonia series by Walter Moers, translated from German into English by John Brownjohn. The first two books have a character in common but aren't related, the third and fifth feature the same main character and take place 200 years apart, and the fourth is another one-off, but all five are set in the same world. They all feature illustrations by the author and a fantasy world like no other. The fifth, which I just finished, is actually only the first half of a huge, rambling story and it was my least favorite (but still enjoyable) Zamonia read, a real fan's book ... but that could change once the rest of the story is available (in The Castle of Dreaming Books, release date unknown). 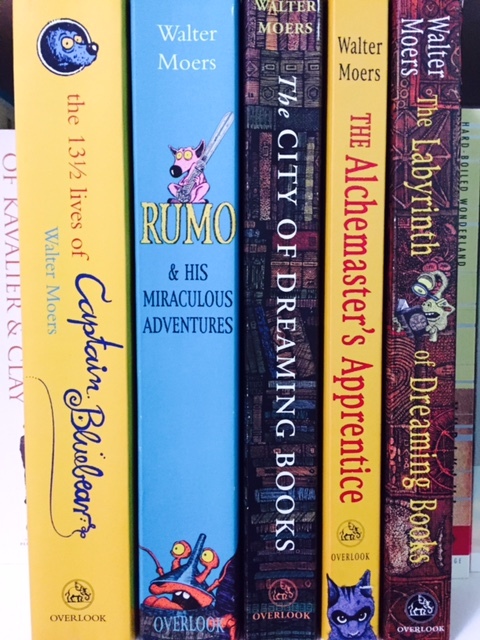 Anyone could easily start with The City of Dreaming Books or any of the other three and discover the world, just in a slightly different order. So what are these all about? A whole bunch of species living in the ridiculously diverse landscape of Zamonia and the city of Bookholm. There is a bit of magic, a lot of unexpected friendships, some intense adventures, and a deep and abiding love for books and words. Main characters can be bears, dogs, cats, or even dinosaurs and eventually you think nothing of it. You get too caught up in the prose, the humor, and the adventure of Moers' tales. Just search for Zamonia on Tumblr and you will see that this series has fans from all over the world that have been inspired to create and dream and explore. So, I'm sure I still haven't satisfactorily explained what these books are about and what makes them so special but, if you're in the mood for something completely different and unique, you may want to give this series a try. Sounds interesting! I'm glad to see these are available as e-books from the library (my default for easy browsing), so I'm putting them on my wish list for future reference. And, if my project of learning to read German should ever get off the ground I might even try them in the original language! Humor and wordplay are difficult to master in another language and even more difficult to translate. However, I'm glad there are translators who have taken up the challenge, so at least something gets through! It's surprising that we have barely heard of them here in the US because he's apparently a very popular author in Germany. Ooh, I didn't know this was a series! I read the 13.5 Lives one several years ago, but I admit I didn't love it, so never tried more by the author. But I trust you! Perhaps I should try again. Definitely skip ahead to The City of Dreaming Books. It's a book-lover's fantasy!